Over the years, there has been significant discussion about batt insulation slumping and loose fill insulation settling. Manufacturers often discount these claims as inaccurate or the result of rumors spread by competitors. They do this because they have test data they believe proves these defects are not real issues. But the perspective of builders, HERS raters, insulation contractors and other boots on the ground is driven by what they see in the field, and that includes settled loose fill and slumped batts. How do we reconcile the lab test with the eye test? In late 2015, Home Innovation Research Labs (HIRL) concluded testing to examine whether fiber glass friction fit batts, loose fill fiberglass and rock wool friction fit batts would slump or settle over time. Specifically, the testing examined whether vibrations associated with door closing, even door slamming, would over time cause slumping of batts or settling of loose fill in wall cavities. Most readers could probably guess what the text above is missing, and that is one critical qualifier: “…when properly installed”. We hear builders say “how can you say batts don’t slump, I’ve seen them do it!” We have too. It is important to understand what this claim means and what it doesn’t. It doesn’t mean that a batt cannot, under any circumstances, slump, or that loosefill can never settle. If a batt is not cut properly for the cavity, or is not in contact on all six sides, it could slump. If loosefill fiberglass is overblown it can settle. Improper installation can defeat even well designed products. Manufacturers saying “our products don’t do this” falls on deaf ears for those who have seen defects in the field with their own two eyes. Likewise, when those in the field say to manufacturers “your products slump/settle” this is met with frustration at the perceived inaccuracy of the statement. The reality is in between. The products in question do not lose some property over time that causes slumping or settling; if they did, it would be on manufacturers to correct this. The truth is that improper installation can result in conditions which, over time, can allow slumping or settling. In some ways, it is more accurate to say the installation slumps or settles, not the product itself. Improper installation can sabotage the performance of any insulation product. The Building Science Corporation (BSC) Thermal Metric testing found, even in controlled lab conditions, spray foam had installation failures that could compromise thermal performance; they are just not readily visible. Humidity, temperature, substrate moisture content, product mixing, storage and shelf life can all impact spray foam installation quality. 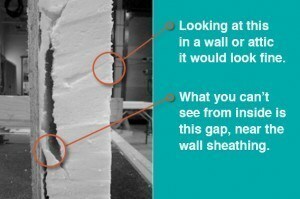 This image from, the BSC report, showed large gaps that ran the length of the bay where the foam separated from the sheathing. It is not helpful for building industry professionals to conflate product attributes with installation variables. Likewise, it is unhelpful for building product manufacturers to pretend that proper installation should be a given in the field. A comparison of competing products should consider both their inherent attributes as well as the installation challenges associated with each, without confusing one with the other. Ultimately, getting the home performance outcomes you want is not just about specifying a given product, it is about designing the home right, specifying products that work together to deliver system performance, installing them properly and then ensuring all of this was actually done right.